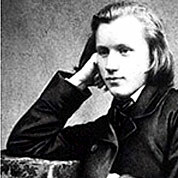 Johannes Brahms was a German composer and pianist, and one of the leading musicians of the Romantic period. Born in Hamburg, Brahms spent much of his professional life in Vienna, Austria, where he was a leader of the musical scene. Brahms is sometimes grouped with Johann Sebastian Bach and Ludwig van Beethoven as one of the Three Bs.